When you're done soaking up the sun along the famous Kenyan beaches, it’s time for a Mombasa safari. Indeed, the combination of a stay at the beaches with a wildlife safari is a popular one among Kenya travelers, including myself. Which Parks Can You Choose From? If you’re not using domestic flights, however, then distance is important due to Kenya’s usually terrible roads. If you’re leaving on a safari, you might not want to spend your precious time in minivans zigzagging around potholes at 20-30 miles an hour. Of the big popular parks, especially the huge Tsavo East and West National Parks are close to Mombasa, with the much smaller but very popular Amboseli National Park a good second. But in the direct vicinity of Mombasa you also have smaller nature and marine parks, which have lots to offer but draws much less tourists. I’ll review them all below. If you can flesh some cash for domestic flights, then you’re only limited by your imagination, since there are various small and safe air companies that fly between Nairobi, Mombasa and most national parks and reserves. All in all, you have many options for a Mombasa safari. These two huge game parks are the largest in Kenya, and within a half day drive from Mombasa. Most visitors of the coast region choose this park for their Mombasa safari. It's a 100 km to the main gate of Tsavo East, which will take roughly half a day, depending on weather and road conditions. The Tsavo parks are home to all the wildlife you would expect to see on an African safari: elephants, lions, antelope, rhinos, water buffalo, zebras and many more. You'll enjoy varied landscapes too, as Tsavo East is mainly savannah scrubland – open plains perfect for wildlife viewing - while Tsavo West is much more rocky. The Shimba Hills reserve is the closest Mombasa safari park – 35 kilometers south of the city. It won't be the dusty dry safari you might expect. Shimba Hills is a rainforest park and filled with lush vegetation. The biggest attraction is the elephant and antelope populations, but if you're lucky you might see lions and giraffes as well. The rare Sable antelope is found only in Shimba Hills. Sheldricks' Falls is another sight you should see while visiting the park, and Giriama Point offers spectacular views of the ocean. Seen from Mombasa, Amboseli National Park is past the Tsavo East and Tsavo West parks on the Kenyan-Tanzanian border, and usually visited along with the larger parks. One of the greatest sights of this safari park is the view of Mount Kilimanjaro - Africa's largest mountain - from nearly any place in the park. Amboseli is especially elephant country, but many other big animals are present too, including the endangered black rhino, lions and antelopes. Unlike some other plains parks, there are some swampy areas at Amboseli which provide a home to flocks of native birds. An added bonus on your Mombasa safari. Besides these nature and wildlife parks, Mombasa also has a number of marine reserves that deserve a visit after your dusty jeep rides. They aren't really "safaris" but still another way to see the native marine wildlife of Kenya. You could check out the Watamu Marine Park, the Mombasa Marine Park and the Diani Marine Reserve. During the rainy seasons, some parks are hard to access. However, the tourist seasons (December-January and July-August) are within the dry seasons. You can access most parks only in a vehicle. It is possible to organize a do-it-yourself safari, where you rent and drive your own vehicle, organize your own tent or camp, etc., but generally it won’t be cheaper than hiring a tour operator. Moreover, a good driver/guide knows where the animals and other highlights of the parks are. 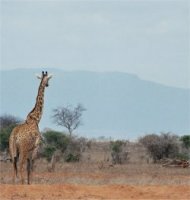 My favorite place for comparing and booking safaris is Africa Guide. They offer by far the largest collection of safari packages in Kenya I've seen, and as dedicated Africa specialists they know much more about Kenya than the big Western travel companies. If you are arranging a safari that spans several days – which is advisable to get the real bush experience - then ask about the accommodations. Don't make any assumptions about the facilities that may or may not be available. Budget safaris will have you camp on public camp sites in smaller tents, while more costly options will have luxury tented camps or fully-equipped lodges with all the comforts of home. The scope is quite wide, so ask for details.